Tiamat, the Dragon Goddess of Chaos and Darkness, is battled by Marduk, God of Justice and Light. This might indicate the change from a matriarchal to a patriarchal system that obviously took place. Before the world as we know it was created, said the Babylonians, there was only Tiamat, the dragon goddess of salt waters and Her consort Apsu, god of the fresh sweet water. Both represent the idea of chaos that precedes form and order, which are the foundation of upon which civilization rests. Tiamat and Apsu are the parents of all the Great Gods and Goddesses of Babylon, who came forth from Tiamat´s almighty womb. No pictures are known of Her, but She is normally said to be a fierce Dragoness in form, or the personification of the Untame, Primeval Forces of the Universe before established order. We also know that as Her young offspring of gods and goddesses grew up, they became so noisy to the extent that Father Apsu could find rest at night. 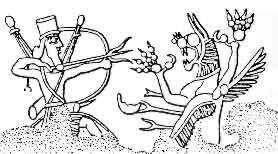 Apsu came to Tiamat to complain about the clamor of the young gods, but first Tiamat paid no attention to Apsu´s concerns. Rivkah Harris, in her excellent study of Gendered Old in the Enuma Elish (Chapter 5 of her book Gender and Aging in Mesopotamia: The Gilgamesh Epic and Other Ancient Literature, University of Oklahoma Press, Norma, 1999) says with deep insight that we first meet Tiamat in the Epic of Creation as a young woman of childbearing years. At this time,She is tolerant and giving, and totally opposed to the decimation of her young. Thus, the younger Tiamat resigns herself to her spouse´s death for the sake of the children. Harris also stresses the point that Tiamat´s image is very positive, because her epithet is elletu, or pure. But Apsu is not appeased and unhappier still about the clamor of the younger generation, together with Mummu, his vizier, father Apsu plots then that both should kill the younger gods to stop the noise once and for all. Tiamat rejects categorically the plan. But the younger gods, fearing that they could indeed be slain by their parents, decided to withstand their ground. After some thought, Enki, the God of Magick, Sweet Waters of the Deep and patron of all arts and crafts, cast a sleep spell upon Apsu and Mummu, and then kills both. Filled probably with sorrow and guilt, Enki withdraws to the marshes of Eridu, and there builds his temple, the E-abzu or E-engurra. It is interesting that one of the names of Enki´s temple is exactly the name of the father the God of Magick had to slain to allow for his brothers and sisters to go on living. Somehow the temple, or the ground and foundation for Enki´s worship, is built upon the essence/legacy of his father. Enki takes refuge in his sacred realm, with his beloved wife Damkina. There, they conceive and give birth to Marduk, their son, a child of wonder, perfect in form and strength, blessed by all gods and goddesses of the land. When we meet Tiamat again, says Harris, She is older, more assertive and independent, therefore deeply shaken by Apsu´s death, now the Caring Mother turns to be the Avenging Spouse. Thus she accepts to fight against her own offspring. As Mother Hubur, the underworld river, who fashions all things, She bore giant snakes with venom for blood, and cloaked dragons with a godlike radiance yet with a terrible visage, for the war. She rallied a horned serpent, a mushussu-dragon, a lahmu-hero, a ugallu-demon, a rabid dog, a scorpion-man, umu-demons, a fish-man, a bull-man, and eleven others underneath her champion, Qingu. She gave Qingu the Tablet of Destinies to facilitate his command and attack. Tiamat is therefor a much more formidable opponent than Apsu, and asserts Her authority in such a fashion that it is mandatory that She should be eliminated. Thus the younger gods need desperately a champion, and there came young Marduk, a hero on the make, still untried, who is chosen as the champion of the gods. Marduk then ventured to try and conquer the greatest of all powers to date, the Ancestress who had given birth to the world that was, but that should accept change and become something else... perhaps more. Qingu's strategy initially confuses Marduk, and Tiamat tried to enspell him, hurling jibes at him. Finally, Tiamat was incited into single combat with Marduk. She continued to cast her spell, but Marduk nets her, throwing winds at the fierce Dragoness. She tried to swallow the winds, but Marduk cut into her heart, crushing afterwards her skull to death. Then there was the enormous effort of picking up the remains of the Great Dragoness, the worthiest opponent ever to a young hero and thus create the new order for all worlds. The parts of Tiamat´s body created the universe as we know it, and the divine fashioner was Marduk. For example, Tiamat´s body fell into the lower universe; one half became the dome of heaven, her eyes became the sources of the Tigris and Euphrates rivers. Tiamat´s and Marduk´s Mystery was celebrated every year in Babylon especially during the New Year´s or the Akitu Festival, where Life was seen as the taming of primeval Chaos, a task that indeed never ends. The Mystery of the Fierce Dragoness and Her Valiant Opponent bring also to light the victory of the hero-centered consciousness represented by Marduk in opposition to the cyclical view of the world centered on communal values, where the collective took precedence over individualism. Marduk is the first heroic dragon-slayer in world history. Remember though that His glory was built upon the remains of Tiamat, to become the glory that was Babylon.